Mix the flour, sugar, lemon zest and salt in the bowl of a food processor. Process to combine. Drop the butter pieces into the bowl and pulse to cut the butter into the flour. Continue until the flour and butter mixture looks like small lentils. Move to a bowl and make a well. Whisk the egg and pour into the well. Using a fork gently mix the egg into the flour mixture. On a lightly floured surface, knead the dough just enough to form a ball, be careful not to over mix. Flatten to a disk, wrap in plastic and refrigerate for at least ½ hour. Remove from the chilled dough and on a floured surface roll the dough out to form a circle big enough to fill the tart pan. Place the tart shell in the refrigerator and chill 1 hour. Preheat oven to 350ºF. With a fork, poke the bottom of the chilled tart shell about 5-6 times to allow steam to escape during baking. Place the tart shell into the oven. Partially bake the shell about 8 minute, it will completely set. Remove from the oven and cool slightly. Peel, core, and quarter the apple. Slice about 3 cups of apple 1/8 inch thick and toss with the lemon juice and 2 Tbsp of sugar. Reserve to put on top of the tart. Slice the rest of the apples and place in a saucepan over medium heat and cook until soft. Beat in the rest of the ingredients and boil until you have a thick applesauce. Spread the applesauce in the pre-baked pastry shell and place the reserved apple slices in concentric circles, overlapping slightly to top the tart. Bake in 350ºF oven about 30 minutes. The apples will slightly brown and soften. 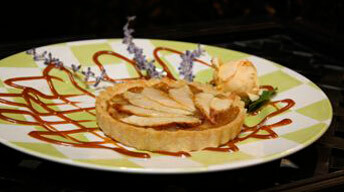 Heat ½ cup of apple jelly and brush the top of the tart when it has cooled slightly.